We’ve teamed up with My Subscription Addiction founder Liz Cadman to curate these two choices from one of her favorite brands. 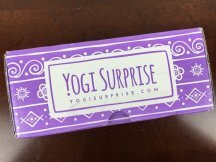 Yogi Surprise has released spoilers for both the regular lifestyle Yogi Surprise Box and the Yogi Surprise Jewelry Box for September 2016! And September’s Jewelry Box features a very special mala! Here are the full spoilers for the upcoming August Artisan Box from GlobeIn – plus customers can use coupon code WELCOME to save $10 OFF their 3-month or longer Artisan Box subscription.